On the day I stopped by, Adair Winery was featuring tastings of five wines: three whites, a rosé and a dessert wine. In general, all of the wines were delicate with stronger earth notes as opposed to fruit – somewhat unusual for the Northeast based on my experiences, where I’ve found either because of the hardier hybrid grapes grown here, or the terroir, or both, the wines definitely tend toward the fruitier with a preponderance of citrus in the whites and cherry and plum in the reds. My tasting kicked off with the 2009 Seyval, a nice delicate wine with a musty earth nose. The light in the Tasting Room was somewhat dim and yellow-y, so I wasn’t able to get a true sense of the color, but it’s close to a pale straw. In the mouth the wine is light and delicate, with earthy notes of light grass and a hint of green pepper. Low acid on the finish gives the wine a much smoother finish than I had anticipated. The tasting notes indicate it is structured along the lines of a Muscadet Sur Lie, and sur lie aged for 7 months. I found that the wine’s delicateness prohibited me from fully appreciating it during a 1 oz sip – although truth is you can’t fully appreciate any wine from just a 1 oz sip – but in this case I very definitely felt that I wasn’t getting the full impact of the wine. Solitary Oak Aged for 8 months in a combination of French and American Oak barrels, this was a stronger, less delicate wine. A blend of 40% Seyval, 50% Vidal and 10% Vignoles, all primarily estate grown grapes, this was my favorite of the five Adair wines I tried that afternoon. The nose is floral with notes of apple blossom. In the mouth, the wine is crisper than the Seyval, while still being somewhat light. There’s a tangy/tart sweetness of green apples on the palate and a nice balance of acid on the finish with a light note of grapefruit. As I describe it, I know it sounds like that might be a strange, and perhaps too tart, combination, green apples in the front, grapefruit on the back, but it creates a really interesting contrast which gives the wine additional character. The oaking is light, providing just a hint of smoke, rather than the butter or cream one often finds with oaked whites. The last of the three whites on the menu was the 2009 Cayuga White, a semi-dry wine that is stronger and fruitier than either of the previous two. The nose is quite strong with lush notes of nectarine and apricot. In the mouth, the wine is soft and sweet with notes of nectarine and orange. The finish is very smooth, and people who prefer their wines sweeter should really like the Cayuga. From there we moved on to the 2009 Rosalis, a 50/50 blend of Frontenac and Dechaunac grapes. The nose is earthy and lightly floral with faint notes of strawberry. The wine is made in a beaujolais style, light and smooth. Strawberry is the predominant note, and the tannins are very light making this a very smooth wine overall. The lighter-bodied, more delicate nature of the wine helps keep the strawberry notes from becoming overpowering. This would be a great sipping wine for a spring or summer afternoon. And then finally, the tasting concluded with the 2009 Blackberry Kir a blend of 95% Cayuga and 5% Blackberry Wine. Not surprisingly the dominant notes in both the nose and mouth are blackberry, but it’s not overpowering or too sweet. In the mouth, the wine is smooth and clean and the rich sweetness of the blackberries, while present, don’t overwhelm the wine. Personally I found it a bit too sweet for my tastes, but it is an interesting wine, and one I would encourage any visitor to Adair to try. With that, I picked up a bottle of the Solitary Oak to sample more leisurely at home, said farewell to my hosts and headed back across the river to Connecticut. On my way back from Walla Walla and before I reached my stop at Bunbury Farm, I stopped at the one winery in the one viticulture area entirely within the state of Minnesota. Alexandria Lakes, as previously mentioned is tucked in between several of Minnesota’s 10,000 lakes. Currently there is only one winery located in this region, Carlos Creek. I pulled into the winery’s driveway on a Wednesday morning in June to find the place packed. Maybe folks were taking 4th of July vacations early, but I got the feeling that the place was used to this kind of crowd. 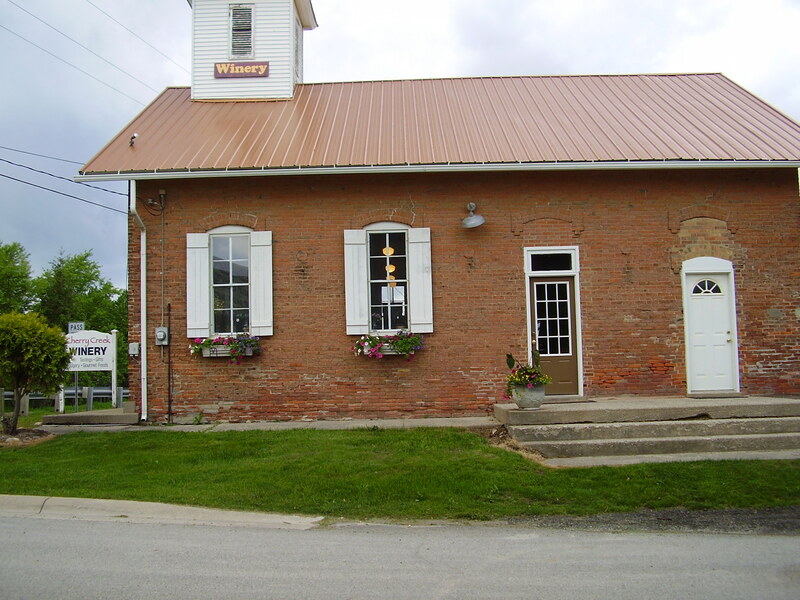 The tasting room was large with a rectangular bar in the center. One side of bar was stocked with the wines shelves and related tchotchkes. The other side of the bar had tables for groups to linger at including a cozy firepit. I walked up to the bar for a tasting ($5.00 which includes a keepsake wine glass) and began to try the wines. I learned that the winery has twelve acres of vines of Frontenac, Foch, Valiant, Swenson Red, La Crescent, King of the North, Brianna, Marquette, Petite Pearl and Edelweiss and fifteen acres of apples including Honeycrisp, the Minnesota State apple. The winery also makes wine from contract grown fruit that is both local and out of state. I began with the Chardonnay (grown in California as that is not a grape to survive the harsh Minnesota winters. The color was beautiful and tasted dry with a nice amount of fruit although the finish was a shade metallic. The Woebegone White was pale and offsweet with the flavors of apples and pear and is produced from Frontenac Gris. This wine is part of the wineries “Minnesota Nice” line which are made entirely of locally grown fruit. It is a nice wine for a hot summer afternoon spritzer (my preferred way of drinking sweeter wines). The line also includes the Hot Dish Red, a blend of Frontenac and Valiant and the You Betcha Blush (a phrase, I sadly associate with Alaska instead of Minnesota these days) which is also Frontenac based. Next I tried the reds. I started with the Marquette. The grape is a recent development from the University of Minnesota which has a strong viticulture program and is the Upper Midwest’s answer to Pinot Noir. It was certainly dry, with distinct tannins and smooth texture. In all fairness though, it was not my favorite as there was a distinct foxiness to the wine. I then tried the house Chianti which is a blend of Sangiovese, Merlot and several estate grown grapes. I liked this wine. Like my favorite kinds of Chianti, it was flavorful and smooth to make it perfect to drink with dinner. The last wine I tasted was the Trinity, blend of Cabernet Sauvignon, Merlot and Syrah and ended up being my favorite wine of the afternoon. I have to admit to enjoy trying traditional varietals from local wineries. I feel that these wines provide a baseline about a winery. I know what California Cabernet is supposed to taste like. When I try the local options, I am better able to pick up the nuances of varietals that I am less familiar with and terroir. The Trinity was cherry and peppery on the nose with a taste spiced cherries and plums. At this point in my visit a tour of the facility was beginning, led by the wineries’ owner Tami Bredeson. We learned that she and her husband Kim became interested in wine and winemaking after he was commissioned to produce a carved mantelpiece for a woman who worked for Robert Mondavi. As a thank you, she gave them a bottle of Opus One and the Bredesons decided to learn more about wine before opening that bottle. I have been on several winery tours and this was about the most thorough that I have seen (particularly for a winery without an extensive history). We learned how they chose the cork for their bottles (Sardinian cork) and the cooperage that they buy barrels from (Kelvin Cooperage). A nice surprise was the cave built under the winery. The Bredeson’s attention to detail is impressive. 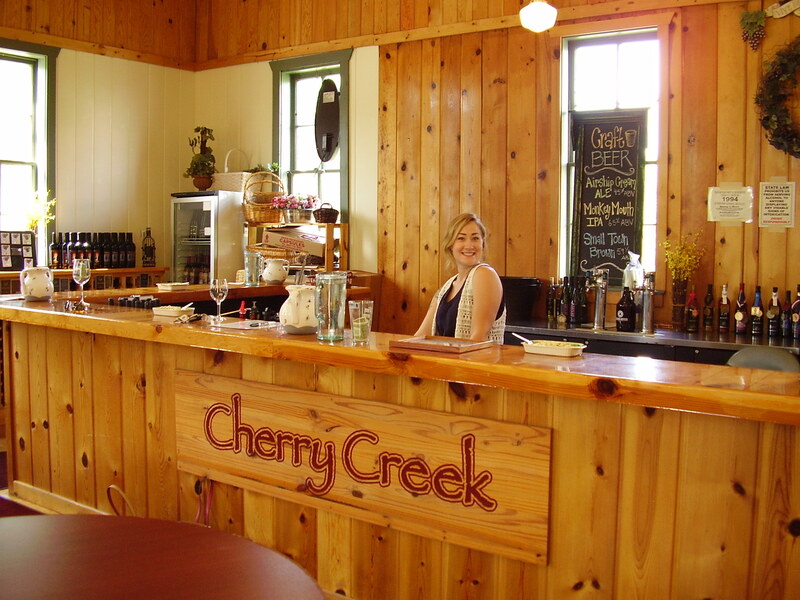 Like most wineries, the Carlos Creek hosts a wide assortment of events in addition to the tastings and tours, including weddings, craft shows, live music, surrey bike rides, mazes for the kids, cross country skiing and dog sled rides. This is not your average country winery. Whhoooa… Back up there partner! I skipped a highlight of Minnesota. Silly me. The AVA is nearly 11,000 acres and home to one winery. Carlos Creek Winery is the largest winery in the State of Minnesota and is located on 160 acres of which 12 acres are planted with vines such as Frontenac, Marechel Foch, Valiant, Swenson Red, La Crescent, King of the North, Brianna, Marquette, Petite Pearl and Edelweiss. They make sixteen wines from their estate grown grapes as well as out of state grapes and juice and six apple wines (there are fifteen acres of apple orchards on the property as well). Best of all? The winery is just a hop, skip and a jump from the interstate! Hoping that I will get a chance to stop!